Logitech's last-gen universal smart home remote, the Harmony Ultimate, went on sale for $119.99 earlier this month. 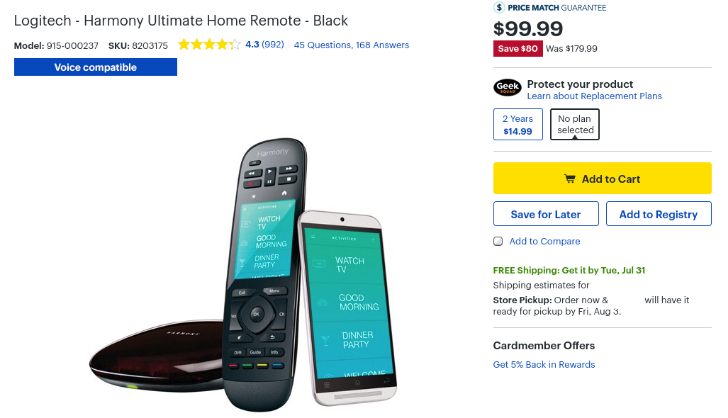 If you missed out on that deal, the remote is even cheaper now. It's currently $99.99 from Best Buy and the Best Buy eBay store. The Harmony Ultimate functions as both a universal TV remote and a controller for smart home devices. The Harmony hub supports a wide range of smart home devices, and it will soon have direct integration with Google Assistant. Android and iOS apps are also available, so you can use your phone as a remote. You can buy the Harmony Ultimate from the source links below.